Sanctus is produced from a true parcel selection. The vines used to produce Sanctus come from a three-hectare portion of the Chateau La Bienfaisance vineyard. The terroir is clay and limestone mixed with iron deposits in the soil. With old vines that are on average 40 years of age, the Right bank vineyard is planted to 70% Merlot and 30% Cabernet Franc. At Sanctus, a lot of work takes place as the vines go through debudding, deleafing and crop-thinning of the second generation bunches. This is to allow for a more uniform ripening and it will also help to reduce yields. Yields can be very low to produce Sanctus. To give you a scary example to illustrate my point, for the legendary 2009 Bordeaux vintage, the effective yields for Sanctus were only 9 hectoliters per hectare! That could set the record for low yields from any top vineyard in Bordeaux. To produce the wine of Sanctus, following triple sortings, which take place both in the vineyards and at the winery, the berries are next moved by gravity flow to large, truncated, French oak tanks for the alcoholic fermentation and a 32-day maceration. Microbullage under the cap takes place during the fermentation process. Malolactic fermentation takes place in 90% new, French oak barrels. The wine is then aged on its fine lies for the first eight months. Finally, the wine is aged in 90% new, French oak barrels for up to 18 months before bottling. 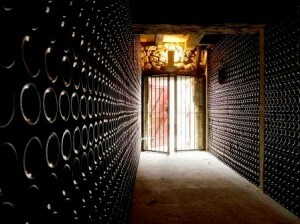 The production is quite small as an average of 650 cases of wine are produced here each vintage. Chateau Sanctus is better with at least 4-6 years of bottle age. Of course that can vary slightly, depending on the vintage. Sanctus is best in its first 5-20 years of life. Sanctus is best served at 15.5 degrees Celsius, 60 degrees Fahrenheit. The cool, almost cellar temperature gives the wine more freshness and lift. Sanctus is best served with all types of classic meat dishes, veal, pork, beef, lamb, duck, game, roast chicken, roasted, braised and grilled dishes. Sanctus is a perfect match with Asian dishes, hearty fish courses like tuna, mushrooms and pasta as well as cheese.